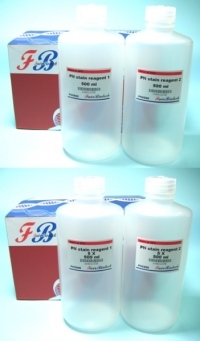 Negative Protein Gel Stain Kit provide a very gentle method of detection that does not require strong acid solutions, organic dyes, chemical modifiers, or protein sensitizers. Another benefit of Negative Protein Gel Stain Kit is its high sensitivity of detection (~10 ng protein/band in sodium dodecyl sulfate-polyacrylamide gel electrophoresis[SDS-PAGE] gels), which is greater than that of the Coomassie Blue stain (~100 ng protein/band) and approaches the sensitivity of the silver stains (1–10 ng protein/band). Indeed, negative staining often reveals many proteins that display low affinity for Coomassie Blue and are thus not detected with this stain. Other advantages of the negative staining technique include the speed of procedure, as it consumes ~ 5-10 min, thus being significantly faster than the Coomassie Blue (> 1 h) and silver (> 2 h) stains. 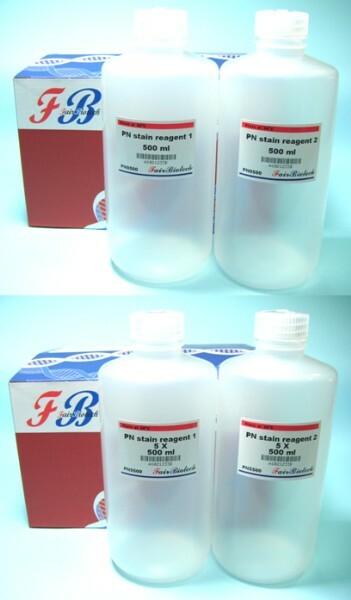 The negative stained gels can be kept in water for several hours to years without loss of image or sensitivity of detection.The risk of protein modification during negative staining is minimal and reverse stained proteins can be efficiently eluted and used in biological and enzymatic assays. Proteins can also be processed for microsequencing or mass spectrometric analysis at any time after detection.